About meI am currently a Ph.D. candidate in the Medieval Studies Program at the University of Connecticut. 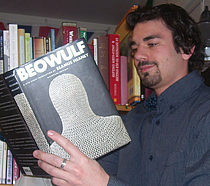 My research interests include Old English and Old Norse languages and literature, religious history, the Bible in the Middle Ages, and medieval religious literature. About my libraryI'm obviously a bibliophile (and an addict, for many years). My biggest and foremost task is building up my collection of texts pertaining to medieval studies--both primary works and secondary works of criticism--so that I have a worthy library for work as a professional medievalist. Academic research interests are pretty apparent from the library, as are my English major background, hobby reading, and favorite contemporary authors.